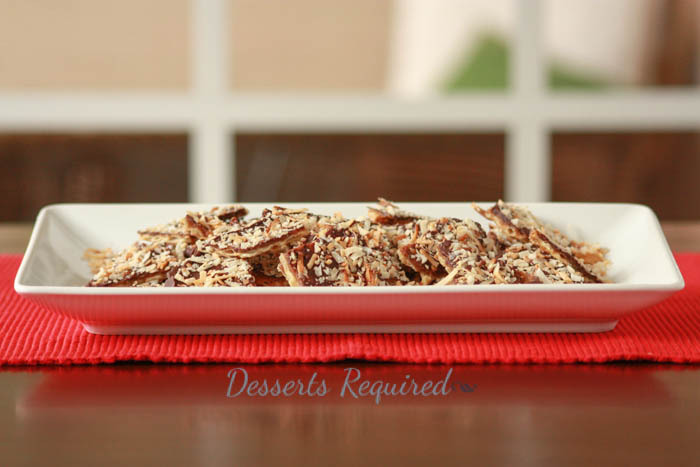 Coconut Chocolate Toffee Matzo Crunch is a perfect, easy and addicting Passover recipe. Passover is approaching which means it is time for me to get busy planning tasty unleavened treats to get me through my 8 days of desserts that do not rise. In the overall scheme of things this is not a big deal. I mean, let’s put it in proper perspective. The Jews had to flee Egypt pretty darn quickly and their bread did not have time to rise. The least we can do in remembrance is avoid cakes and treats that contain yeast products. Giving up flour is easy enough and there are so many delicious flourless desserts that one is not lacking for options. It was always been the candies and snacks that I felt came up short. In the past I blogged Chocolate Toffee Matzo and Matzo Munch. This year I decided to make Coconut Chocolate Toffee Matzo Crunch. 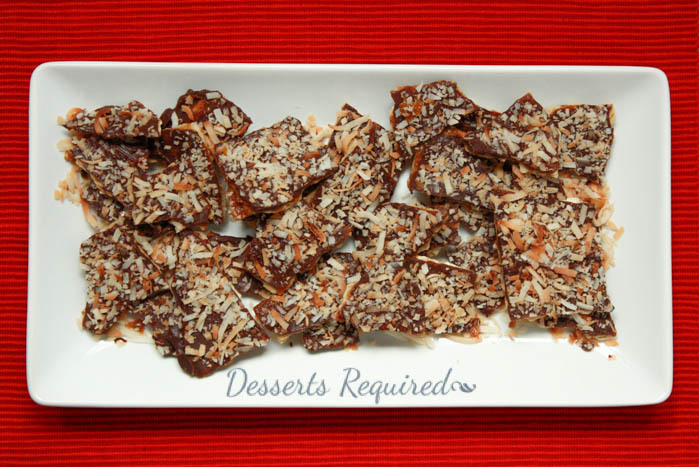 I started with the Chocolate Toffee Matzo and dressed it up with toasted coconut. I love breaking the gigantic pieces apart and then picking out the best Coconut Chocolate Toffee Matzo Crunch pieces to have as a snack. Unfortunately for me, I have yet to find one that was anything but the best. Speaking of best, I couldn’t think of a better way to help find delicious recipes than by sharing some of my fellow bloggers Passover desserts. 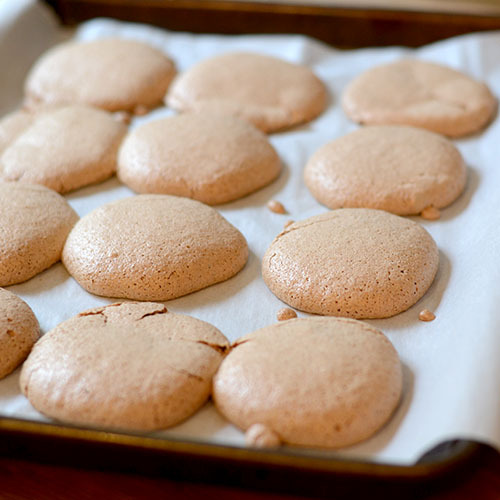 Please enjoy Cocoa Macaroons from Feed Your Soul Too. Don’t forget to let Peter know how delish his cookies are! Line a large baking sheet with heavy duty aluminum foil. Place the matzo in the pan, breaking the pieces so that they fit. Set aside. Place the butter and sugar into a medium saucepan. Bring to a boil over medium heat. Boil for 3 minutes, stirring constantly. Pour the caramel over the matzo. Spread evenly with a small metal spatula, covering all of the matzo pieces. Bake at 350° for 15 minutes, rotating the pan front to back halfway through. Remove from the oven. Turn the oven off. Sprinkle the chocolate chips over the matzo. Place into the oven (turned off) for 1 minute. Remove and spread the chocolate evenly over the matzo. Sprinkle the toasted coconut over the chocolate. Gently press into the chocolate with the back of a spoon. Allow the pan to cool completely and then transfer the pan into the freezer to allow the Coconut Chocolate Toffee Matzo Crunch to set completely. Peel the matzo off the foil and break into pieces. Your choice if they are large pieces or small pieces. What a great Passover dessert!! I am definitely making this! Thanks so much. Coconut Chocolate Toffee Matzo Crunch sure do make the 8 days fly by!! Betsy, these look great and I like the addition of the toffee. Thanks for doing this Passover dessert post with me. The pleasure was all mine. I think Feed Your Soul Too is great and I was thrilled you asked! This looks awesome! I love toffee and coconut, and chocolate! Yum! Thanks so much. It is mighty yummy! That looks so good! Great twist with the coconut! I’ve always wanted to make the toffee matzoh crunch…but you’ve taken it to a new level by adding coconut! Sounds amazing!!! Thanks so much. Be careful, this is VERY addicting!! If you make the recipe with Saltines, let me know what you think. Happy Passover to you and yours!